Thank you again to everyone who voted in the second IndyCar Flashback poll for Open-Wheels.com. This week’s winner featured a fight to the finish between some of the series’ rising stars, and an incredible pass for the win just before the checkered flag. 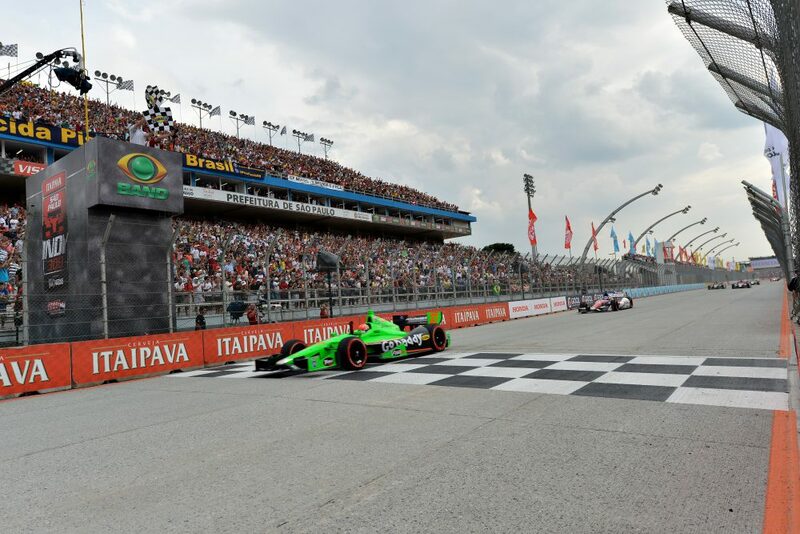 Here is the subject of this week’s IndyCar Flashback – the 2013 Itaipava Sao Paulo Indy 300. 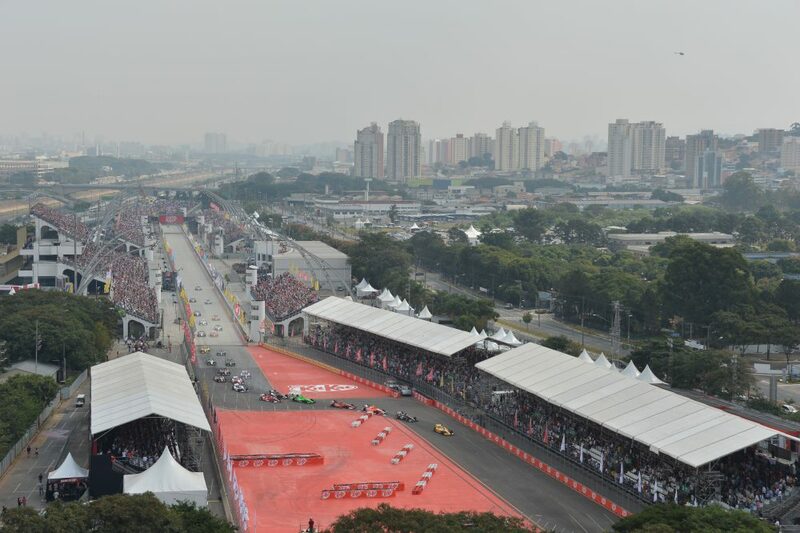 With an excitable fan base and several drivers representing its home nation, the Sao Paulo Indy 300 had become one of the most anticipated races on the IndyCar calendar. The street race, a 75-lap endeavor on the 2.4-mile temporary circuit through the streets of Sao Paulo, connected the series with a market of dedicated and knowledgeable race fans in their time spent south of the border. Team Penske’s Will Power, who looked to earn his fourth win in as many events at the street course, ran into some early trouble in his quest for a four-peat. The Australian, who had not won since the 2012 edition of the race, would start 22nd after being caught in a red flag and being unable to advance in qualifying. James Hinchcliffe takes the checkered flag just ahead of second place finisher Takuma Sato. On the pole for the race was Andretti Autosport’s Ryan Hunter-Reay. The 2012 series champion would lead the field to green, and pace the way for the first nine laps. Hunter-Reay would eventually relinquish the lead to hometown favorite and 2004 series champion Tony Kanaan. On lap 17, Will Power’s efforts for a fourth win in a row would end prematurely. After working his way up to 11th, the Australian’s Dallara-Chevrolet caught fire and brought out the second caution of the day. Just before the field came back from caution, Kanaan relinquished the lead to Dragon Racing’s Sebastien Bourdais, Bourdais would hold serve for 13 laps, until Long Beach winner Takuma Sato grabbed the top spot in search of his second IndyCar win. Over the next 23 laps, the race lead would change hands five times between five drivers, including Marco Andretti and J.R. Hildebrand finding their way to the front. Two laps after the race’s final caution for an accident involving Dale Coyne Racing’s Justin Wilson, Sato took command of the race. The A.J. Foyt Racing driver led the next 18 laps in his Dallara-Honda. On the last lap, Sato would receive a major challenge from Andretti Autosport’s James Hinchcliffe. Hinchcliffe, the winner of the 2013 opener at St. Petersburg, battled fiercely with Sato. Hinchcliffe pulled a daring crossover move and throttled by Sato on the last lap for his second win of the season. Check out the final lap of the race below. Video courtesy of INDYCAR and NBC Sports. One of the most exciting IndyCar finishes in the past handful of years, here is how some of the biggest headliners of the race have fared since. The third season of his IndyCar career proved to be the breakout season for the Canadian. Hinchcliffe would add a win at Iowa Speedway in July to his impressive season. After spending 2014 with Andretti, the popular driver switched over to Schmidt Peterson Motorsports for 2015. The year started promising, as he scored a victory in the rain-soaked race at NOLA Motorsports Park early that year. Tragedy struck the following month, though, as Hinchcliffe suffered a violent practice crash at Indianapolis Motor Speedway just six days before the 99th Indianapolis 500. His resilience was proven throughout a long recovery process and in 2016, Hinchcliffe would start from pole in the 100th Indianapolis 500, less than a year after is near-fatal crash. In 2017, he would break a long winless streak by winning at Long Beach. 2013 would be the highlight of Sato’s time with A.J. Foyt Racing, as he did not see victory lane again. In 2017, the veteran racer would move to Andretti Autosport and experience his best IndyCar season. Sato won two poles and the biggest race of all, holding off Helio Castroneves to win the 101st Indianapolis 500 in May. For 2018, Sato will reunite with Rahal Letterman Lanigan Racing, where he drove in 2012. Despite the early struggles of 2013, Power would win three of the final five races and finish third in the points standings. The strong run to end the season positioned Power well for the 2014 campaign. After winning three races, Power would avenge the previous heartbreaks in his career and secure his first IndyCar championship, beginning a stretch of three titles in four years for car owner Roger Penske. Despite the excitement of the final laps of the 2013 race, the Sao Paulo Indy 300 would not return to the IndyCar schedule the following season. Efforts were made to add another Brazilian track to the schedule in 2015, this time in Brasilia. Less than two months before the race was scheduled to run, the race was cancelled by newly-elected Federal District officials. Although the race is no longer part of the schedule, the 2013 Sao Paulo Indy 300 provided a memorable finish for fans and helped launch multiple drivers into IndyCar stardom.